The Hacienda Beach Club & Residence 3 bedrm./4 bathroom. This unit is located in the closest building to the spa, pools and restaurant and is one of the only units with spectacular direct sunlight from all four sides having views of the beach and marina. It has a very generous sized interior floor plan with three terraces off the front and a fourth off the second master bedroom. This 3-bedroom/3.5 bath luxury suite interior was recently professionally designed to complement the exterior views and provide extraordinary comfort. This unit features a full kitchen with top of the line appliances. There is a generous living room with an entertainment center and pocket sliding glass doors that open completely into the wall to bring the outside in. In addition to the living room there is a full sized dining area, an office, and washer and dryer. Relax on any of the four terraces that surround this suite and enjoy the amazing views from every room. The three bedroom suites can accommodate up to 6+ people in comfort. The master bedroom has a king sized bed with views of the ocean, land's end and the marina with two separate glass doors leading out to the terrace. The bathroom has his and hers separate vanities, a walk-in shower, large soaking tub and walk-in closet. The second suite features another king sized bed, sitting area, private terrace, and private bathroom. In the third suite you'll find a queen bed, private bath and sliding glass doors overlooking the spa. With the three master sized bedrooms, all with their own en suite, you can have the privacy you desire while enjoying spending time with your guests. Housekeeping and concierge services can be customized for your visit. To keep rates reasonable and to create flexibility for my guests, the house keeping is not included. The on-site concierge can arrange any services requested from grocery delivery, to a chef to prepare your meals, to making reservations for restaurants or excursions you choose to enjoy. They are ready to make it happen. The Hacienda Beach Club & Resort boasts a world class spa and fitness center with yoga, spinning and Pilates classes. Make sure to visit the spa for a massage or facial before hitting the beautiful infinity pool overlooking the private beach. The resort also offers and includes a variety of outdoor activities (with free equipment rentals) for the entire family, including kayaking and stand-up paddle boarding. The on site Hacienda Cocina y Cantina Bar and Restaurant has some of the best local and regional cuisine. 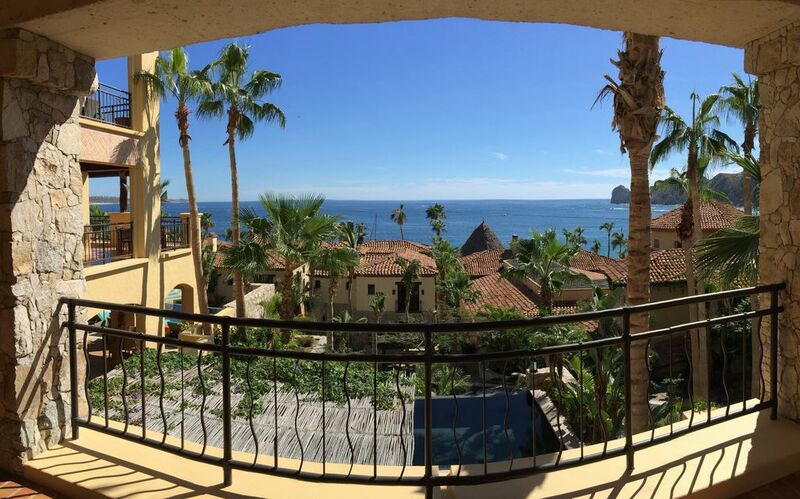 If you are looking for the privacy and comforts of a villa with all the amenities of a resort without the timeshare promotions, you have found your home away from home. We accept Visa, MasterCard and will consider other payment options. 50% of the total rental amount is required to secure a reservation. The remaining 50% will be collected 30 days prior to check in. For reservations made less than 60 days from departure, 100% is due at time of booking. Rates vary with the seasons. We will try to meet or beat the resort's best rates and offers. Discounts available for longer stays - please inquire. Amenities include: brand new comfortable furniture, flat screen TVs in every room with satellite (US stations), free Wi-Fi, beach towels, toiletries, hairdryers, stove/oven/microwave, wine cooler, fully stocked kitchen, ocean view and marina view, crib rental, flatware, dinnerware, glassware, health and beauty spa, steam room, walk to beach and pools, on site jacuzzi/hot-tubs, daily housekeeping, ice-maker, ironing board, washer/dryer with detergent, drying racks, coffeemaker, safe, make-up mirrors, access to cycling, hiking, snorkeling, scuba diving, deep-sea fishing, sail boating, restaurants/bars and shopping at luxury boutiques, all within walking distance. Easy access to the unit. Elevator access. In the unit, pool side & the gym. World class golf course in the Cabo San Lucas area. Inquire with the owner about the golf courses at Diamante. The Hacienda Beach Club is set along a private stretch of Medano Beach in the heart of the Marina with easy, direct access to a world of shopping, dining, sightseeing, sports, entertainment, nightlife and recreation (land and water). Making a choice as where to dine will be a difficult task, only because there really are so many wonderful places to choose from - all within walking distance. The beach, the sun, the spas, the night life and activities have something special for all types of people who may have totally different vacation styles. There is something for everyone. Come see for yourself. Hacienda is beautiful and this unit is perfect!! Great location on the property. Highly recommend staying here!! Unit was beautiful, nothing but a real positive experience! I knew to stay in building 4 or 5 and couldn't of been happier! The owner is VERY easy to deal & responds right away which was really appreciated. I've stayed in about 4-5 different units but will only be returning to this one! Thanks Steven! This was our fifth visit to the Hacienda Beach Club and Steve's unit was by far the nicest we stayed in. Spacious and beautiful. Being in Building 5 is a convenience that shouldn't be underestimated. If you wanna be on Medano and close to everything I can't think of a better place to be. Love this property, would definitely recommend it. Great location & a beautiful property. Came to cabo with my wife and two other couples. This was a great place to stay and we would come back in a heart beat!